You might remember our September Q&A with The Kickback, a band that recently came to Chicago via South Dakota and have hit the ground running by playing shows around town and generally getting the word out. The band will head into the studio to record an EP in November, but for now are offering a few songs and videos from a recent session for free download via The Sioux City Journal. The songs are "The Wheelers," "War Chest" and "Snuff Film Credits," with video clips also available for "The Wheelers" and "Snuff Film Credits." 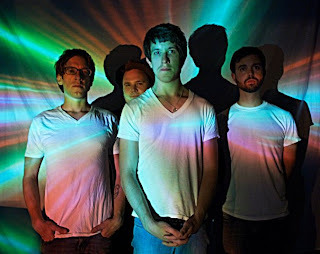 The site also includes an article on the band's recent achievements, including the following positive write-up by Rolling Stone: "High drama Chicago-based rock band (with at least one very rabid fan) conjures the very best parts of the Veils and the Walkmen and the Killers, writing lean, nervy songs that snarl and snap. Guitarist Billy Yost has a marvelously agonized voice and he wrenches notes from his larynx, hurling himself against the songs’ propulsive rhythms." You can check out another free Kickback mp3, "Roman Regret," here, and catch the band live at Reggie's on November 18 and Hideout on December 4. Saw The Kickback in Los Angeles a while back....great stuff. Come to Washington State, fellas! Seattle more specifically.